The pattern of buttons on the front of an officer's frock coat allowed an observer to instantly identify the wearer approximate rank without being near enough to see the grade device of the shoulder strap. This would have been useful on the battlefield; for example, when a courier need to pick a general out of a group of officers. The practice was stated to have originated with the French. When viewing period photographs these distinctions are helpful even though the exact number of buttons may be obscured by sashes, belts, etc. These button patterns can occasionally also be found on other non-regulation coats, other than frock coats, that were worn in the field, such as short coats or jackets. Click on the image or caption and see additional information. Company officers wore a single breasted frock coat with nine evenly spaced buttons down the front, which was the same pattern worn by enlisted men. A difference was that the cuff of enlisted men had two small buttons and an inverted chevron in their branch color, while officers only had three small buttons and no chevron. Field officers wore a double breasted frock coat with seven evenly spaced buttons down the front of each row. They also had three small cuff buttons. 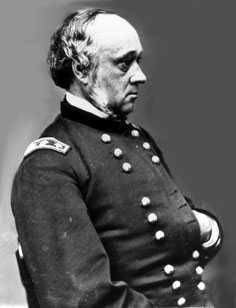 Brigadier generals also wore a double breasted frock coat, but they had with eight buttons grouped in pairs down the front of each row. They also had three small cuff buttons, but their cuff were of dark blue velvet. The button pattern worn by major generals, the major general commanding (general-in-chief) and by the lieutenant general (U.S. Grant) were all the same. This was a double breasted frock coat with nine buttons grouped in threes down the front of each row. They also had three small cuff buttons and cuffs that were of dark blue velvet.